Glory to God in the highest. This church was rebuilt (with the exception of the Chancel) and a new Porch and Vestry built in the year of our Lord 1856. Charles S. Baldwin and Thomas Gigg - Churchwardens - and J. S. M. Anderson Rector of Tormarton with West Littleton and Acton Turville. The benefice is annexed as a Chapelry to Tormarton, in the deanery of Hawkesbury. The church is a small structure in the style of the middle centuries, consisting of a Nave only, with a low octagonal turret. There are no benefactions to the poor. It is not known how much of the earlier church building survived the fire. The Chancel is slightly offset from the Nave. The barrel vaulting of the Chancel roof suggests an earlier style of architecture. Tiles on the Chancel floor were fashionable at the time that the church was rebuilt and may be from the Minton factory who began producing glazed tiles from medieval patterns from 1830. 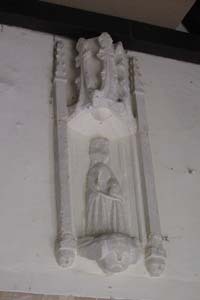 The earliest marble monument on the North wall of the Chancel commemorates Rev. William Alsop and his wife Mary, 1750. The oldest recorded member of the Alsop family was born in 1596 and was interred in one of the chest tombs in the churchyard. Here lyeth the Body of Robert Hale, of this Parifh, who died 28 August, 1723 in the 97th year of his Age. 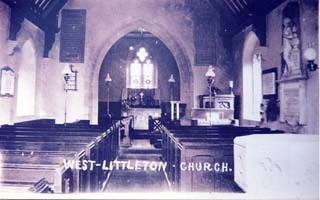 "As owner and possessor of one of the most considerable estates in the said Parish of West Littleton and is destitute of a decent and convenient seat or Pew in the said church And therefore hath request been made unto us to Grant and Confirme unto the said Elizabeth Hale two old Pews situate on the North side of the said church of West Littleton and are the uppermost save one in that Range or Rowe of Pews and doe containe in breadth six Foot and Four Inches and in Length four Foot and ten Inches or thereabouts soe that when she the said Elizabeth Hale shall have made and converted the same two old Pews into one decent and convenient Pew she and her successors Owners and Possessors of the Estate she now enjoyeth and her and their families may have hold and enjoy the said two Pews converted into one Pew as aforesaid and stand sit and kneel and hear and attend divine Service and Sermons therein without the Intrusion Intromission or Interruption of any other person or persons whomsoever." The windows, although not matching, are all the same perpendicular style. A photograph of the church taken earlier this century shows that there were once paintings either side of the Chancel arch . These were the Creed and The Lord’s Prayer. The church was then lit by oil lamps and holes may be seen in the choir pews and front nave pews where the oil lamp stands were housed. Where the table now stands near the door a chimney (removed at some stage) suggested that the church may have been heated by a Tortoise stove or similar - also a hearth was built in the Vestry to keep the Curate warm! Monuments in the Nave include - on the North side - an early monument topped by an urn in marble by Tyley of Colerne to Francis Francom 1748 and Betty his wife 1789, also to Edith Osborne 1782, Richard Francom 1787 and his wife Elizabeth 1800. In 1805 Elizabeth Francom left a charity of the value of £2/ 2/- yearly arising from one third of the net dividends of £210, 2 3/4% Consolidated Annuities, applied to the purchase of clothes, distributed on St. Thomas’ Day to poor men and women of West Littleton, the remaining two thirds to be disbursed at Marshfield in like manner. A smaller classical Georgian monument in marble is to the memory of Mrs. Frances Osborne 1822. The South wall is dominated by a large marble memorial also by Tyley of Colerne to the Hillier family. In marble relief upon a black marble surround is the figure of Hope, holding an anchor, derived from early Christian symbolism related to Hebrew 6:19 “we have this hope as an anchor for the soul firm and secure”. The draped female figure stands by an urn. This was a popular style of memorial from the end of the 18th century up to the Victorian period. This memorial commemorates Sarah Hillier who died in 1819 aged 23 years and eight other members of the Hillier and Osborne family. A tablet erected by the Blake family commemorates the two villagers killed in the 1914-1918 War. Above the church door is a much worn Royal Coat of Arms. Above the door is what Arthur Mee in “The Kings England” describes as West Littleton’s most precious heritage. A lovely canopied niche above the doorway with very worn figures of Mary and Jesus and three tiny faces below. They are probably 600 years old. A fretted and pinnacled style of niche is in the style of the 13th century and it has been suggested that the figures may have been mutilated during the time of destruction of Roman Catholic idols. The 13th century turret is of stone and typical Cotswold design. 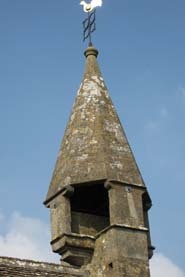 Other local examples include those at Leigh Delamere, Old Dilton, Biddestone and the sanctus bellcote at Castle Combe. Of these, West Littleton is proportionately the biggest and finest: there are others in Gloucestershire. In 1989 the turret was restored and strengthened with stainless steel tie rods and additional strengthening provided by the galvanised rolled steel joist from which the bell hangs. A new weather vane was then provided. The finial cross of wrought iron dates from 1855. The bell is one of mid 13th century date, perhaps coeval with the turret and second in age only to the ancient bell at Tytherton Kellaways in the Bristol diocese. It is of local and national importance. 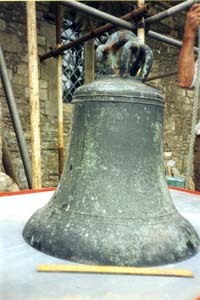 The bell is approximately 17 inches in diameter and weighs about 1cwt. In 1993 the bell was removed, returned to Whitechapel Bell Foundry for cleaning and to have the wrought iron cast-in crown staple removed before this rusting pin threatened to crack the bell. A new clapper mechanism and a new hardwood headstock were fitted. The bell retains its fine looped canons (the loops from which it is suspended and which are an integral part of its casting ) and its argent. Externally the bell has a long waisted profile and it is ornamented by two moulding wires placed close together just beneath the shoulder, and two more similarly arranged just below the soundbox curve and above the lip. The features of the bell testify to its great antiquity. 5) Nathaniel Osborn 1752, Sarah Osborn 1769 aged 97 years. 18th century headstones include:- Mary Hulf 1741 - wife of Michael Hulf: John Smart 1723: John Smart Junior 1773: Iffaac, son of Thomas Millard 1708.